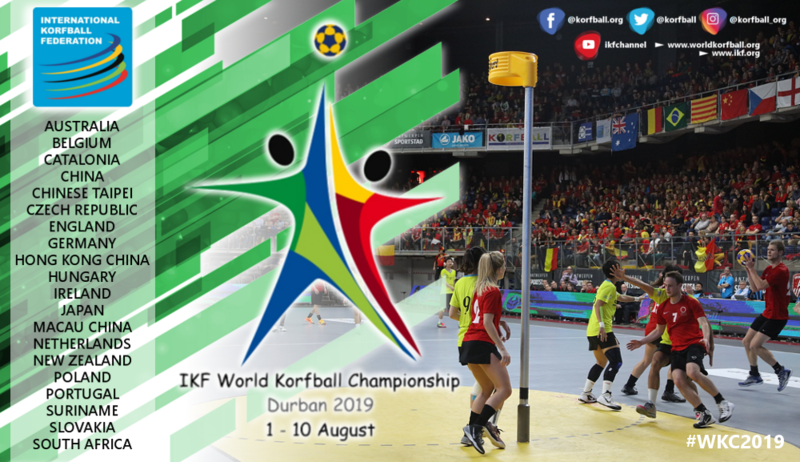 The IKF World Korfball Championship (WKC) 2019 is getting closer and closer. Today, we announce the tournament set-up and the pool draw criteria. The 20 participating countries start playing in five pools of four countries. 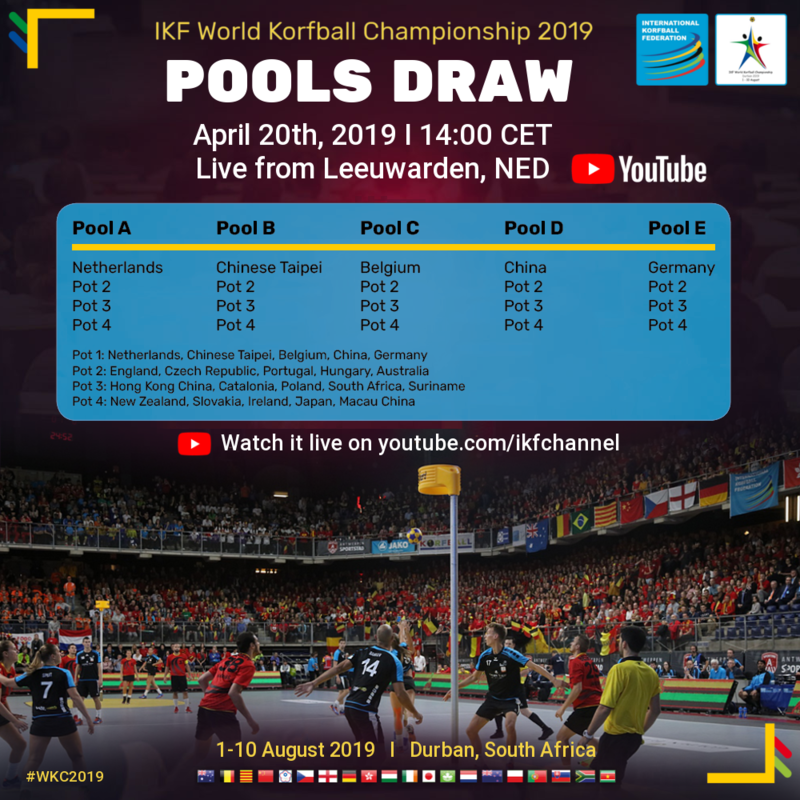 The top three of each pool and the best number four qualify for the round of 16 and stay in the race to become the World Korfball Champion 2019. The remaining four countries will be playing against each other in a round-robin system, with a final at the end, to determine their position in the final ranking (position 17 – 20). The exact match schedule after the group stage will be announced closer to the draw in April. To decide the line-up of the five pools, an open draw will be conducted. 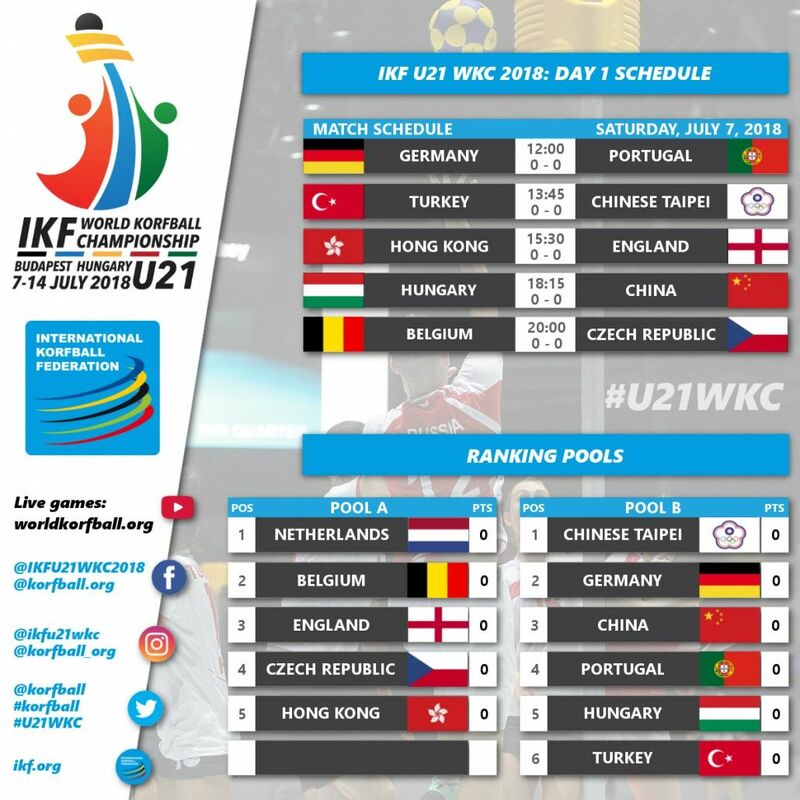 This draw will be held during the IKF U19 World Korfball Championship in ‘t Kalverdijkje, The Netherlands on Saturday, April 20th at 14:00 o’clock. For the draw, the 20 participating countries have been divided into four pots. Pot 1: Netherlands, Chinese Taipei, Belgium, China, Germany. Pot 2: England, Czech Republic, Portugal, Hungary, Australia. Pot 3: Hong Kong China, Catalonia, Poland, South Africa, Suriname. Pot 4: New Zealand, Slovakia, Ireland, Japan, Macau China. Pool leaders are not drawn but are fixed, based on the top five of the IKF World Ranking. The IKF World Ranking as per 31-12-2018 is used to decide which countries end up in Pot 1-4, taking into account that all Continental champions are at least positioned in Pot three. It is not allowed to have four European, three Asian or two Oceanian countries in the same pool. Therefore the draw of Pot 4 will be adjusted accordingly. The drawing is completed per pot. So, first all countries presented in Pot 2 are drawn, then all countries in Pot 3 and, finally, all countries in Pot 4. The draw can be followed live through the IKF YouTube channel. Pool A: NED, BEL, ENG, CZE, HKG. Pool B: TPE, GER, CHN, POR, HUN, TUR. SEMIFINAL GAMES for 1st-8th PLACE.